Posted on May 5, 2014	by Katy K.
I note with some shame that this was the Book Smuggler’s Old School Wednesday Readalong from February, which I did not finish it in time. Jaran. 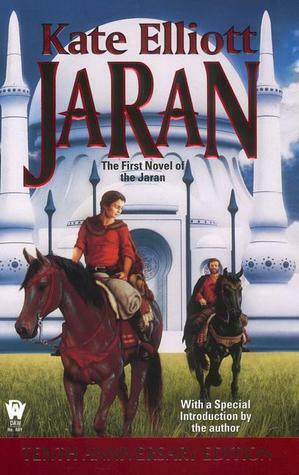 Jaran Book 1. by Kate Elliott. DAW Books, 1992. I’m very fond of Kate Elliott, and her Spiritwalker books are some of the most heavily borrowed in my home library. This includes some of the Elliott trademarks that I love, including a mix of politics of very different levels, strong characters, romance, and playing with ideas of gender and race. Here, race is looked at both through Tess’s relationship with the Jaran, the human-like people she meets on the planet Rhui, as well as the much more alien Chapalii. There’s even more focus on the role of gender, as Tess is dropped into a culture where women are the decided head of clan, with the sole power to initiate love affairs, while the men are left in charge of hunting, war, embroidery, and deciding whom to marry. Tess herself has an affinity for languages, picking up the utterly foreign language of the Jaran in a week, that I was able to accept only as a necessity for her exploration of the Jaran culture, where the difference in languages and what you can say in them plays a key role. We go camping in a the Mongolian-style yurt my love made every summer, so it’s always an extra pleasure to read about similar nomadic cultures – though their physical culture and looks sounded more Russian than Mongolian. Elliott says in the introduction that she was aiming not for a matriarchy but for an equality different from that we’ve imagined. I loved how the culture felt like a traditional culture – one where people did things because that was the way they had always been done, rather than making decisions out of a sense of justice or equality. The balancing act that women have been expected to perform in Earth culture for centuries, making themselves pretty for men and showing just the right level of flirtation while staying modest enough, seems as ridiculous as it is when done by men. I just wasn’t quite sure I could buy that having men marry women by cutting their faces made for any kind of equality – it just didn’t seem to fit in with the rest of their culture. Likewise, the clan matriarchs shrugging their shoulders over men deciding to ride off to war – really? Surely the male contribution to the hard life of the steppes is important enough that they would be expected to consult with the women before risking their lives on something nonessential. However, not necessarily agreeing with her conclusions doesn’t mean failure – I still noticed the things she was bringing up and thought about them, inside the context of a good story. On the body count level, this book fell in between the Crossroads books (of which I’ve read Spirit Gate and Shadow Gate and the Spiritwalker books, with some battles and some very significant characters killed off.The only things holding me back from reading more of this series is the need to interloan them, their heft, and my feeling that I really ought to read Traitors’ Gate (which I had been planning to read in February) first. As always, though, Kate Elliott provides a satisfying, thought-provoking adventure. This entry was posted in Books and tagged adult science fiction, Kate Elliott, Mongolia, Old School Wednesday. Bookmark the permalink.